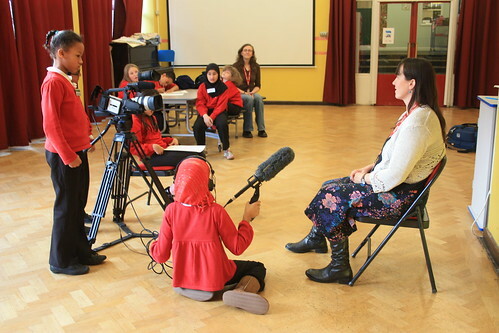 Pupils at Park Hill School have been working hard over the past few weeks with Rachel Gillies – Community Film Maker to create two short oral history films about Moseley Road Baths. The project has involved the group researching the history of the building, learning how to use film equipment and how to conduct oral history interviews. The group then divided into two film crews to film and interview two members of the public who had very fond memories of the Baths, particularly swimming there with their children. The project started off with a fun look at the building using the Virtual Tour website, which allowed the group to look at parts of the building usually closed off to the public. Through the site we were able to watch films of the laundry room, wander onto the roof and explore the Slipper Baths! The pupils had loads of questions not just about the building, but about the wider social history of Balsall Heath, making lots of connections between what was happening locally and what they know about 20th Century British History. After learning how to use film and audio equipment, the two film crews did an excellent job of interviewing Marion and Fran, who both recall swimming regularly at the building. Fran told us about swimming regularly when she was pregnant and how much she enjoys swimming with her children now they are older. 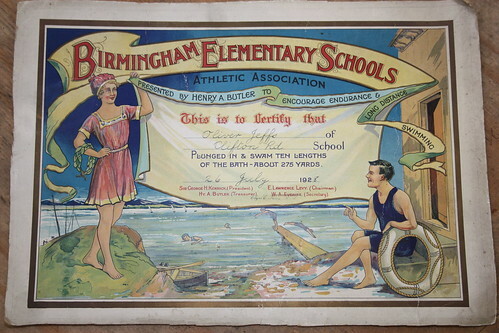 Marion praised the pool’s excellent swimming lessons – both school lessons and the ‘Strokes’ programme. She told the group how important it was to learn to swim and how staff at the Baths have helped her learn to swim as an adult. The films were screened at our recent Pool of Memories Art Exhibition. 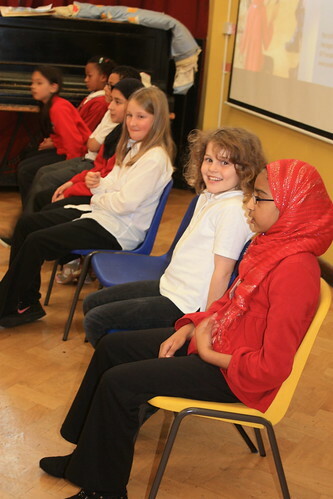 However, on Tuesday pupils did a proper Premiere of the films in front of almost 120 classmates from Year 4 and Year 5. The group presented the films and explained what they had learnt over the course of the project, before going on to answer questions from the floor. 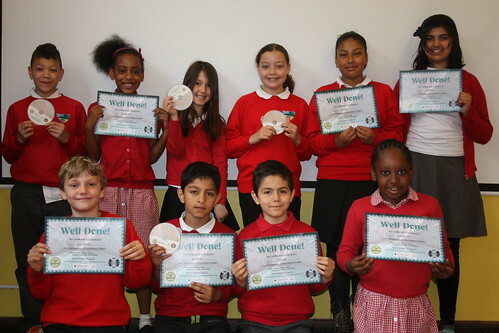 They will now be given their own copies of the DVD and certificates to reward them for their hard work! The films will be added to our archive and will be appearing on the Pool of Memories website shortly! Thanks to all pupils and to staff at Park Hill School for being so accommodating! Where to start with summarising last Saturday’s fantastic art exhibition and celebration of Moseley Road Baths’ 104th Birthday? We were overwhelmed by the response from artists and those who attended on the day; what a timely reminder with the Baths currently closed that it still remains as popular and loved as ever! First off I must say a huge thank you to the artists who produced such fantastic work! Please do look them up and support them! They are: Anne Irby Crews, Eleanor Leonne Bennett, Harry Starling, Heather Ramsden, Helen Flanagan, Maria Reaney, Michelle Bint, Paul Hull, Paul Jessett, Robert Geoghegan, Rose Jennings and Vivienne Harrison. Thanks also to Corinne Fowler who read an excerpt from her novel which vividly describes a full-immersion Baptism at Moseley Road Baths – something that the Riverside Church used to do. She did an excellent job of transporting the audience to the poolside in the absence of our annual tours! The day was also an opportunity to celebrate our Pool of Memories project so far. The bits of our archive out on display really got people talking and we got so many wonderful stories and great feedback! A number of people left their details for us to interview them, and this wonderful certificate was shown to us which dates back to 1928! I was lucky enough to do two wonderful oral history interviews with visitors. Betty spoke about her first attempts at swimming in the early 1930s and going for weekly baths, right through to swimming as a teenager, courting with Fred (now her husband!) and taking their daughter there when she was a toddler. Ruth was visiting from Yorkshire and spoke fondly of her 13 years of working as a lifeguard and how it was so much more than lifesaving but about building important relationships with the whole community. 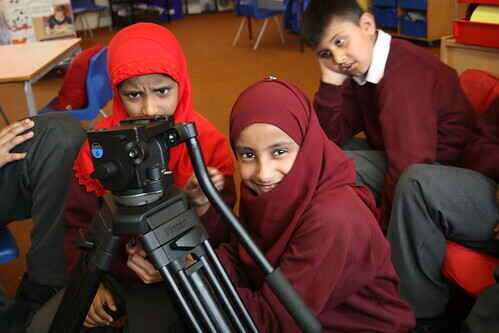 We also screened films from our Pool of Memories School project, including Premiering two films produced by pupils at Park Hill School over the past couple of weeks. A few of the pupils were in attendance and proudly showed their work off to family! Finally, a massive thank you to all those who volunteered their time on the day and to the staff at the School of Art for making us so welcome. 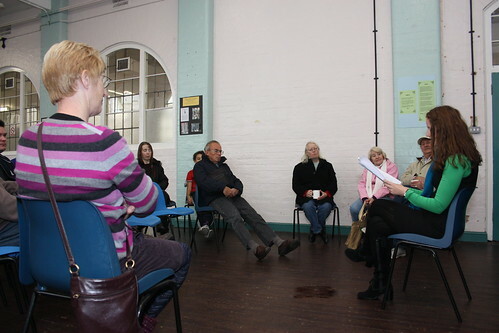 Over 110 people were in attendance which I think is a huge achievement for a voluntary group! Please do let us know what you thought of the event so we can build on this success for next year’s event! Plans are now well underway for this year’s annual event as part of our ‘Pool of Memories’ project. 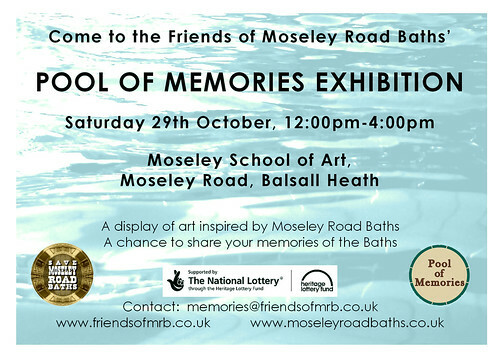 On Saturday 29th October, noon-4pm, Friends of Moseley Road Baths will be taking over the Moseley School of Art on Moseley Road (opp. the Baths) for the day to celebrate the Baths’ history and beauty through the medium of art! Today we have selected 12 local artists’ work to exhibit, encompassing a wide range of mediums, including photography, illustration, sculpture and portraiture. 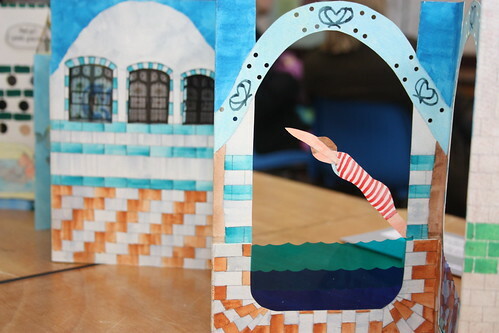 All of the work has been inspired by the building itself, swimming, or water. The ‘Pool of Memories’ exhibition will not only be the only opportunity to see all of these works together, it will also be a rare chance to see inside the former School of Art, itself Grade II* listed. 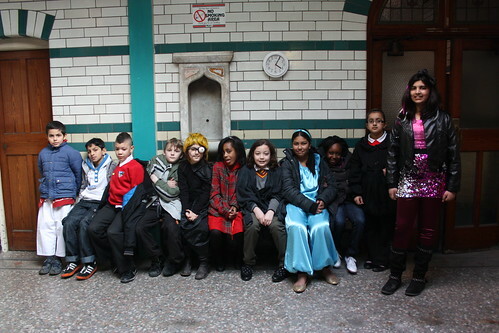 In addition we will be screening short films produced by local pupils as part of our Pool of Memories School project. 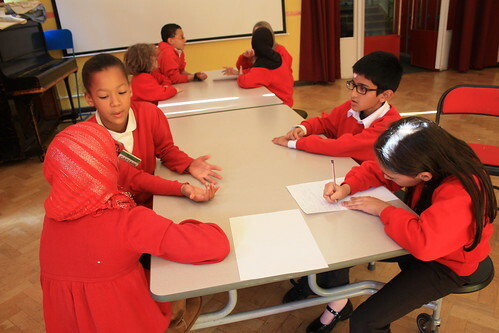 Pupils from Park Hill School, Anderton Park School, Clifton Junior School and Percy Shurmer School have filmed and conducted oral history interviews with people who remember swimming, working or washing at Moseley Road Baths. 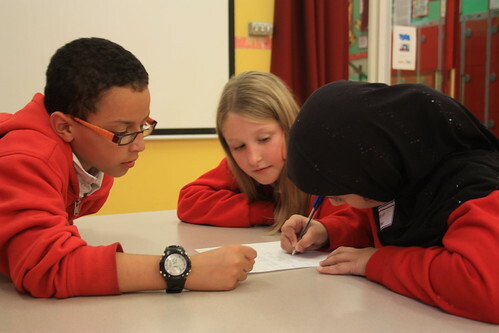 We will be premiering the most recent films from pupils at Park Hill School on the day – filming only took place today! We shall also be welcoming Corinne Fowler to the event who will be reading an excerpt from her novel which features an account of a full immersion baptism in the swimming pool! As usual there will be a selection of stories from our ever growing oral history archive on display as well as an opportunity to contribute to the archive with your own memories. 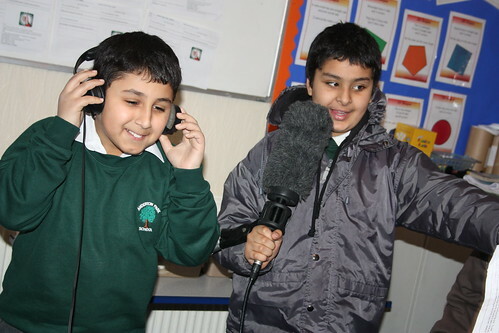 If you would like to share your stories on audio recorder or on film then please come along! 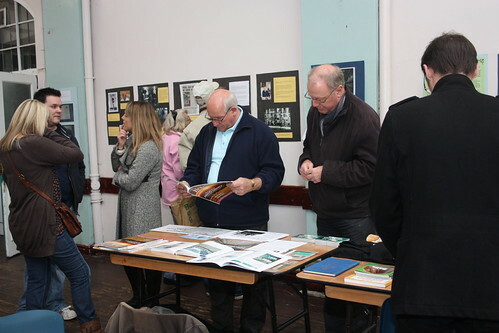 Don’t forget that our exhibition is wonderfully complemented by the Balsall Heath History Fair and Exhibition taking place next door at the Make It Zone! The History of Moseley Road comes to life! 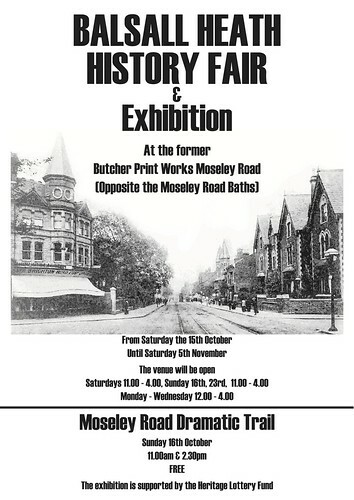 From 15th October until 5th November Moseley Road’s history will be brought to life as never before! The Balsall Health Local History Society are exhibiting a selection of over 200 photos from the area, many of which have never been seen before. In addition there will be dozens of artefacts, a mini school room and a slideshow and film showing the neighbourhood in years past. The exhibition takes place at the ‘Make it Zone‘, formerly Butcher’s Print Works, located next door to the School of Art, opposite the Baths and Library. The venue will be open Saturdays 11.00 – 16.00, Sunday 16th, 23rd, 11.00 – 16.00 Monday – Wednesday 12.00 – 16.00. If that wasn’t exciting enough, head down to the Moseley Road (outside the Make It Zone) on Sunday 16th October at 11am and then again at 2:30pm as astonishing scenes will take place in Balsall Heath… a history trail along the Moseley Road will be dramatically interrupted by various scenes from the past including the escaped lion from the Sherbourne Road Zoo, the 1791 Church and King Riots, the 19th. Century Fire Brigade and its wandering horse… and much more! The exhibition and Drama Trail are being supported by St Paul’s Community Development Trust, The Heritage Lottery Fund, MACE West Midlands, and the BBC Reel History campaign. 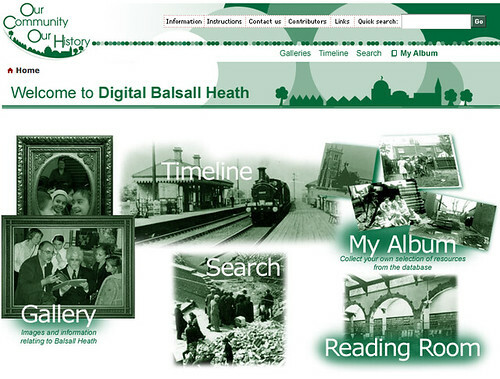 This compliments the Society’s excellent Digital Balsall Heath online archive project which we reported on back in August. Don’t forget that on the 29th October you can indulge in a whole afternoon of history and locally produced artwork by also visiting our own Pool of Memories Exhibition between 12noon and 4pm next door in the School of Art. We are accepting your artwork until the 17th October. 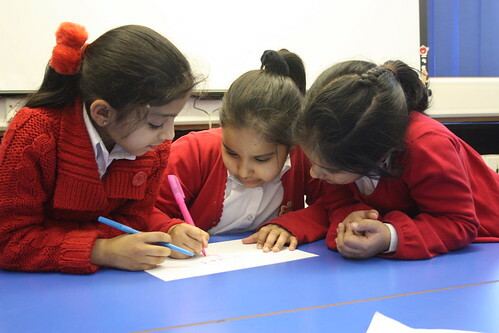 We’re really excited to hear about this collaboration between the smashing folks over at Balsall Heath Local History Society (who have been really helpful with our research and have supported countless events that we’ve hosted) and MACE‘s (Media Archive for Central England) ‘Full Circle’ Project. There’s a full report of the launch event on MACE’s blog. The collaboration has seen staff from MACE assist local historians in locating archive film footage and then convert it into a format which can then be added to the MACE archive and used by local groups. 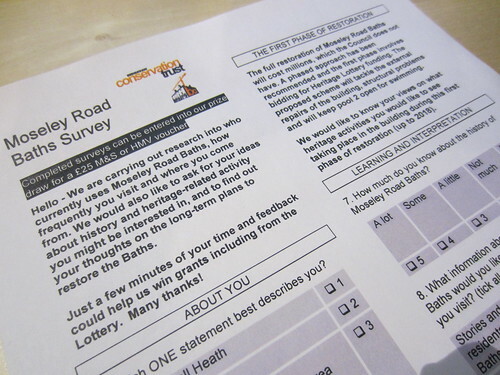 In this case, material will appear on the new Digital Balsall Heath site, which aims to be an online, interactive resource for people wanting to look at the history and heritage of the area. Best of luck to the group, we shall most certainly be adding material as our own Pool of Memories Project develops! Margaret’s Exhibition is now open! 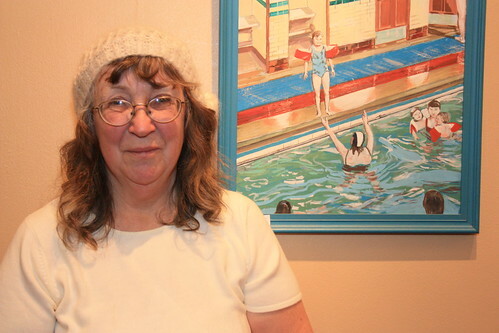 Thanks so much to everyone who came to the launch of Margaret Braithwaite’s exhibition of oil paintings of Moseley Road Baths. It was clear from the event how passionate people are about the building and what fond memories they have of swimming there. The exhibition is on at the beautiful Birmingham and Midland Institute on Margaret Street for the next couple of weeks. Jen and I went onto Carl Chinn’s show on Radio WM yesterday to discuss the exhibition and some of the work we’re currently doing through the Pool of Memories project. You can listen again on the BBC iPlayer until the 13th February at http://www.bbc.co.uk/i/p00dtv0m/, we are on from 47:20 for about 10 minutes.